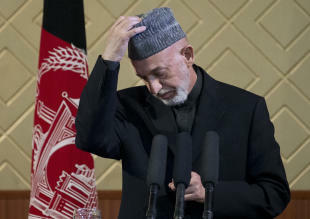 Sen. Bob Corker, the top Republican on the Senate Foreign Relations Committee, is still trying to get answers from President Barack Obama regarding Afghan President Hamid Karzai's claims that he has been getting deliveries of CIA cash for years. "I write again to request an explanation of the incoherent United States policy in Afghanistan made evident by the claims of cash payments to President Karzai," Corker wrote in a letter to Obama on Thursday. The Tennessee lawmaker—who has made two previous written requests for information, to no avail—noted that a key U.S. goal in the war-torn country has been to battle corruption. "I am deeply concerned that these alleged cash payments undermine these efforts and enhance corruption in Afghanistan," the senator wrote. "Even if these alleged payments may have short-term value for the United States from a national security or intelligence perspective, they may be severely counterproductive in the long run." The senator urged Obama to keep key lawmakers—notably, himself and Senate Foreign Relations Committee Chairman Bob Menendez, D-N.J.—informed "of all U.S. government activities that relate to our foreign relations, regardless of the classification of such information." And so, Corker concluded, "I want to request—for the third time—information regarding the alleged payments to the Karzai government and its officials, including a classified briefing, as appropriate." Corker sent his first letter to Obama on this issue on May 2. It went unanswered, his office says. He wrote a second time on May 14. That message, too, according to his office, went unanswered. Corker tried to get an answer from Under Secretary of State for Political Affairs Wendy Sherman, the State Department's No. 3 official, during a hearing. It didn't go well. Corker: Let me just ask this question. If—do you think that delivering cash to a government that's been around for many, many years and is democratically elected aids us in fighting corruption? Corker: But delivering cash to a leader, an elected leader, does that help us rout out corruption in that country? Sherman: I think, Senator, we, of course, want to rout out corruption every way we can. And my sense is the particular instance that you're discussing is better discussed in a classified session. Corker: Well, you know, had it been discussed in a classified setting, I couldn't talk about it. And yet the president of Afghanistan is talking about it, and so it is in a public setting. And I expect a public response. So I thank you. I guess I'll have to ask the president of Afghanistan what is happening with this cash. But thank you so much.